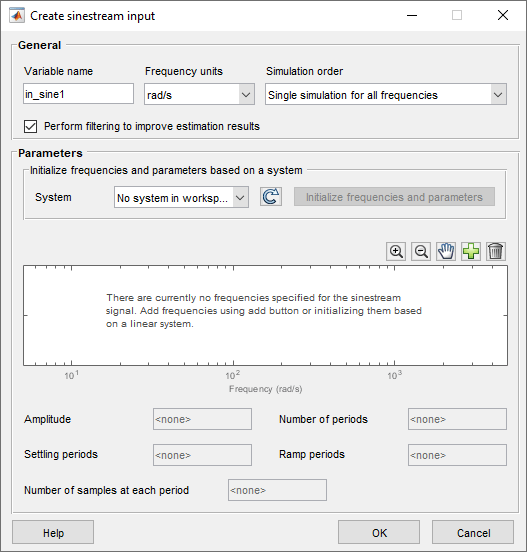 This example shows how to estimate the frequency response of a portion of a Simulink® model using the Linear Analysis Tool. To estimate the frequency response, you specify the portion of the model you want to estimate, the operating point for estimation, and the input signal to use for estimation. 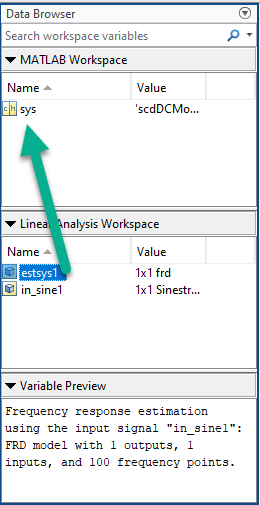 In the Simulink Editor, select Analysis > Control Design > Linear Analysis. The Linear Analysis Tool opens. By default, Linear Analysis Tool uses the linearization analysis points defined in the model (the model I/Os) to determine where to inject the test signal and where to measure the frequency response. The model scdDCMotor contains predefined linear analysis points: an input point at the compensator output, and an open-loop output after the unit gain block. For this example, use these predefined model I/Os to obtain the frequency response of the inner loop of the model with the outer loop open. In the Estimation tab, in the Input Signal drop-down list, select Sinestream. The Create sinestream input dialog box opens. To specify frequency points for the input signal, Click . 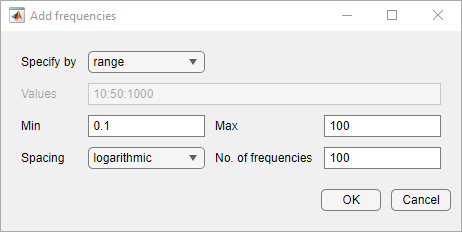 In the Add frequencies dialog box, specify the frequency range and number of points for the input signal. The frequency points you specify are the frequencies at which Linear Analysis Tool computes the estimated response. For this example, specify a range from 0.1 to 100 rad/s. Also, specify 100 logarithmically spaced frequencies. Click OK.The added points are visible in the frequency content viewer of the Create sinestream input dialog box. Select all these frequency points for the estimation input signal. Specify the amplitude of the input signal. Enter 1 in the Amplitude field. When you specify a scalar value, Linear Analysis Tool uses the same amplitude for all frequencies. Click OK to create the sinestream input signal. The new input signal, in_sine1, appears in the Linear Analysis Workspace. You can now estimate the frequency response and generate a frequency-domain plot of the result. To do so, click Bode. The estimated frequency response, appears in the Linear Analysis Workspace as the frd model estsys1. 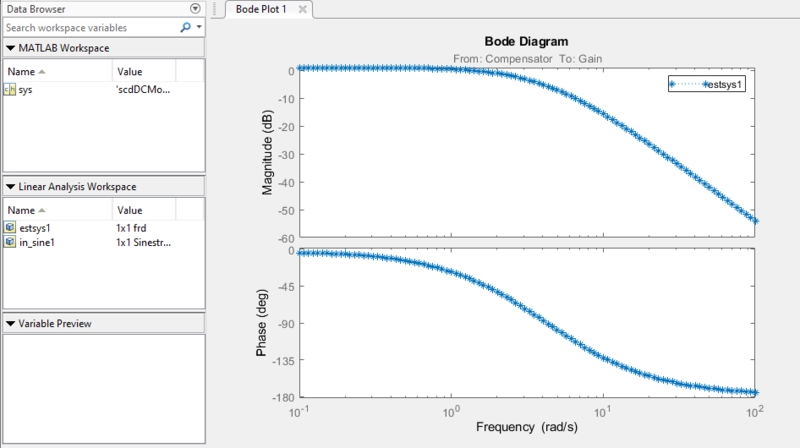 To export the estimated frequency response model to the MATLAB® workspace for further analysis, drag it from the Linear Analysis Workspace section of the Data Browser to the MATLAB Workspace section. The simulation results viewer in Linear Analysis Tool lets you examine further details of the frequency response estimation. For more information, see Analyze Estimated Frequency Response.